Irvin Huerta had thoughts of becoming a police officer when he was younger. He wanted to give back to San Francisco, the city where he was born and raised. At first, he did other jobs, but when one of his best friends, Moises Frias Jr., was shot dead by gang members in 2009, he knew for sure that he would become a police officer. “Just the fact that he was a good person, his family was good people and something like that happens to him for no reason, that was a big motivator for me to wanna do something where I could try to prevent something like that from happening,” said the 31-year-old. 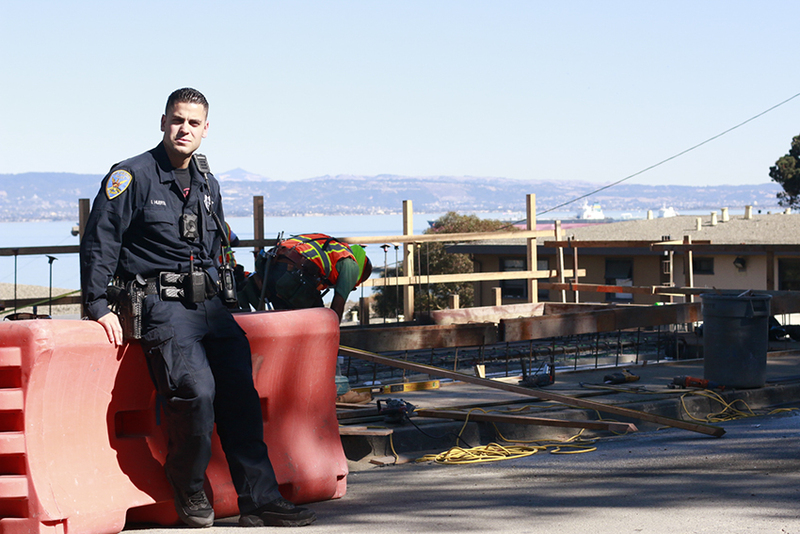 Three years later, Huerta joined the San Francisco Police Department. For the past two years, he has been on the four-member homeless outreach team in the Department’s Southern District, an area that extends from the South of Market to the bay and that has more than 3,000 homeless residents, the most in the city, according to the latest San Francisco Homeless Count & Survey. Officer Huerta, who in September received the San Patricio Award, which honors first responders, offered his perspective on how the city and the police have evolved in working with the homeless, the kind of work that he does on a beat that he wants to stay on, and the experiences in his life that make him suited to the work. That life began in Excelsior with a stop in the Mission, the neighborhoods where Huerta and his two older siblings were raised by their mother, Marta Betancur, a Colombian cook with the work ethic of an immigrant determined to do right by her children. Officer Huerta talks about his mother — a “hardworking,” “loving,” “friendly” and “very good” person — with the affection of someone raised in the lap of a happy family. Indeed, Betancur said, she is proud of her children because they are honest and upstanding, just as she had raised them to be. She was, however, surprised that Huerta had chosen to become a police officer because, as a child, he had shown an interest in the kitchen. “I saw you as more of a cook,” she said in Spanish, laughing at the memory. The only missing piece in Huerta’s family was his father, who left when Huerta was about six years old. This, Huerta said, meant he grew up having to confront family struggles and other problems. “I’ve become humble through this,” Huerta said. He explained that his background helps him relate to people he meets on the job because many have had tough lives, and he thinks about their backgrounds and situations when dealing with them. If the 2009 shooting provided the impetus for Huerta becoming an officer, the 2015 police shooting of 26-year-old Mario Woods in Bayview created a broader realization for the SFPD. Woods, like a third of the homeless in San Francisco, suffered from mental health issues, and his shooting was a wakeup call for the Police Department. C.I.T. training instructs officers on how to manage behavioral crisis situations in the field. Like 704 other employed SFPD members (as of April), Officer Huerta has completed it. “It’s very helpful, because a lot of the people we deal with nowadays do have a lot of mental illness,” he said. Officer Huerta sees this in his weekly five-day, 10-hour shifts in which he and his partner Lawrence Gabriel patrol the Southern district. As they drive around, they respond to more than 30 calls a day from residents who have complaints about the homeless or their encampments. The number one complaint, Officer Huerta said, is of people acting erratic — having mental episodes — and this is closely associated with drug use. The homeless outreach officers encounter a lot of people who are addicted to methamphetamine and some to cocaine, he said. Heroin’s pretty popular, too. The second most common complaint that they respond to is about the presence of homeless encampments in neighborhoods. Officer Huerta said that over the past two years of working as a homeless outreach officer, the public, the SFPD and city agencies have gotten a better understanding of homelessness, and have increased efforts to find solutions. But without enough housing, the problem persists. These days, Officer Huerta said, the homeless outreach officers get many complaints from new areas. Part of the reason, he said, is that tech companies are moving into old warehouses in the South of Market and Third Street areas, where the homeless used to set up tents or encampments. So the homeless are forced to move to new areas, and new complaints flood in. What makes Huerta the happiest at work is when he helps someone, he said, and what he does makes that person glad and grateful. And what makes him the saddest is seeing homeless children with parents who are not in the right mindset because of drugs. While Huerta said that his role has not changed over the past two years, the length of time that he has spent as a homeless outreach officer has allowed him to build relationships with the unhoused. “They know they can reach out to me if they want any kind of help,” he said. It is a style that works. Officers can change their beats every six months, but Officer Huerta sees himself doing homeless outreach work longer. “I like what I’m doing currently,” he said.